It had been in the making for some time, but yesterday it became official. On the Senate floor, Jeff Flake, the junior Senator from Arizona, declared that he would not seek re-election in 2018. Simultaneously, he threw down the gauntlet to his fellow Republicans in a blistering speech aimed squarely at Donald J. Trump, castigating the mogul for the decay of political discourse. Among other things. Flake’s departure after only a single term comes in advance of a widely anticipated primary challenge from the Trumpist right, one which Flake was expected to lose. Notwithstanding the threat of a primary, Flake had already earned himself the distinction of being America’s least popular senator less than four months into his term. I’d like to be clear about two things: firstly, that Flake’s speech and call to action to stand against Trump and the political degeneration that he represents are worthy of attention. Flake’s speech was firm, articulate, impassioned, and predicated on critical American values. Secondly, Flake’s political career wasn’t any of those things. Flake legislated at almost all times as a lockstep stooge of the generic Republican rank-and-file. This calendar year alone, he has supported efforts to torpedo the Affordable Care Act without a reasonable replacement, supported the nomination of Neil Gorsuch to the Supreme Court, and introduced a bill that would allow ISPs to share and sell customers’ browsing history without their consent. Earlier this year, his book was published. Its title: Conscience of a Conservative. So that’s where it was hiding, between the covers of book number 44093 in the nonfiction/politics section. Perhaps now that the American public can find it for $17.21 with an Amazon Prime discount, Mr. Flake has also gained the ability to locate his conscience. His speech certainly makes a claim to that effect, although it should be noted that his first order of business this morning was to vote against consumer financial protections against big banks. He’s pinned a burr to Mr. Trump’s backside, and represents an unknown quantity when it comes to Trump’s agenda, but for the moment Sen. Flake seems content to keep screwing over Americans if it’s the Republican party line. Fellow retiring dissident Sen. Bob Corker joined him in this vote, suggesting that the moral level-up each of these men appears to have reached remains insufficient to stand apart from the Republican agenda and make the same critical observations about its principles, or lack thereof. Maybe it’s a coincidence; maybe it just so happens that Sens. Flake, McCain, and Corker are a trio of malcontents who also happen to have determined that they won’t be trying for reelection in the age of Trump. I don’t think anyone really believes that, though. Trump has at this point personally, directly, and publicly insulted 1 in 5 GOP Senators. 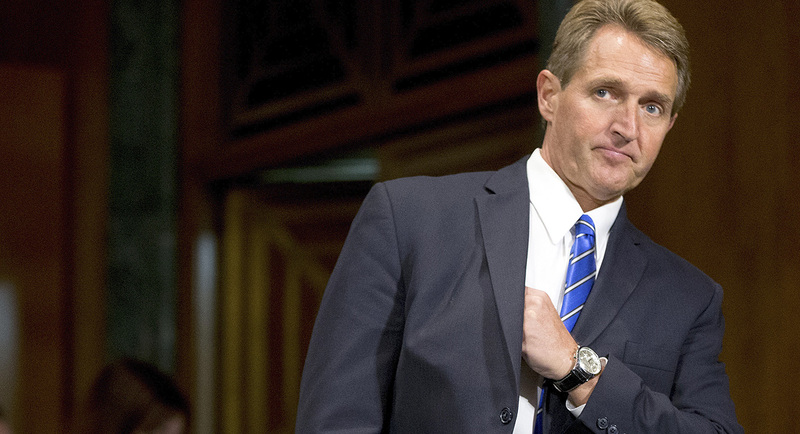 Flake’s speech drew support from many of these, including Mitch McConnell. His dismissive, arbitrary, narcissistic stumbling from issue to issue, coupled with his legion of unforced errors and knee-jerk defensiveness, have surely disgusted the Republican establishment. Trump is not an easy color to wear. Fourteen months left, Mr. Flake. Let’s see if you can walk the walk or if you choose to chill on the Republican sidelines. If you choose the former, you may yet make a substantive difference in American politics and in the lives of millions of Americans. If the latter, you should start your job search with the Kellogg Company. They’re the number one name in frosted Flakes.